Many small to medium business owners understand there are opportunities to growing business online but don’t have the budget to invest. Like many areas of business, if you simply think outside the box there’s always opportunity hiding if you’re prepared to turn over a few rocks to look for it. 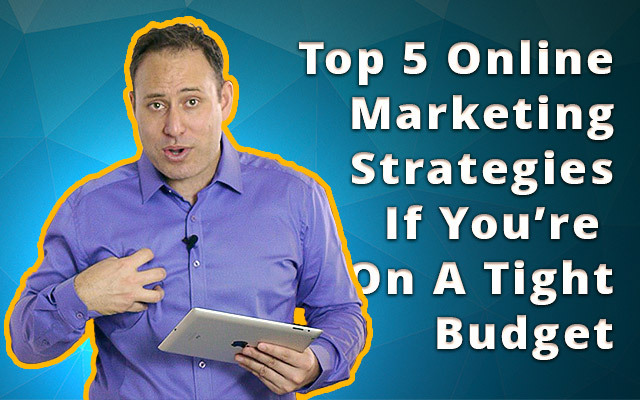 In today’s session we cover the top 5 online marketing strategies if you’re on a tight budget and how ANYONE can use them to get a ROI for your online marketing efforts. Hello and Welcome, David Judge here and today we’re going to talk about the Top 5 Online Marketing Strategies If You’re On A Tight Budget. This can be is you’re a startup, want to get some extra turnover or have some pretty tight purse strings and want to find other ways to get potential customers but simply don’t have the money to spend. Before we get into it, I wanted to mention the balance in business and the idea of Money Vs Time. The saying ‘Money makes the world go round’ is so true in many parts of life. Money can buy you stuff, it can pay for education and in business can leverage your business growth. Sure, money alone won’t do it all for you (as you’ll still need physical work combined with experience), yet if you have money in reality it makes it easier. (yes I’m getting a little philosophical, but stick with me here). In business if you don’t have the money, you still have a really powerful tool – TIME. Time in many ways can be used as an exchange for money which is the perfect lead-in for these strategies, as each of these 5 strategies will take you time to complete and I would say you could sustain them for a period of time by yourself, but ultimately the objective would be to EVENTUALLY have someone else doing them for you. So as we share each strategy I want you to think of how you could do these yourself to get started and then ultimately how you could pass them onto someone else. One of the most common ways to do this is to set up a Google Place Local Account which is basically a way of showing Google your local location and the areas you service. You can also upload images and videos of your business, link back to your website and finally, get your clients to leave reviews for your business (which will show people why they should deal with you). The end result if you set this up correctly (ensuring you focus on adding as much value as possible) is to show up locally when people search for your business in the search engines. One special point to note when you’re setting yourself up on the internet (using Google Local for example) is to keep everything consistent meaning your business name, address and contact details are consistent and match the exact details of your business. Social media can take a lot of time so if you’re on a tight budget then choose one to two to focus on and go for it. One of my personal favourites is LinkedIn as my target clients are Businesses which makes the LinkedIn B2B approach a perfect fit for me. People can see my experience, recommendations, content and why they should do business with me. The reason I mention this point is you need to ensure you approach your social target audience being mindful of the social platform. I would not place anything on LinkedIn (for example) mentioning my weekend out with my mates or a pictures of me wearing a bikini as my profile image (not that I would post that anywhere). Also, when using social media don’t just keep posting stuff, Interact and engage meaning comment on others which will actually show you are interested. Last point, be mindful that social media will take at least 6 months of elbow grease before you get traction. Keep up your consistent 6 month efforts and you’ll reap the benefits. This is offline and online as some of the greatest online opportunities can happen as a result of meeting and talking to someone face to face. I have sourced some of my biggest online deals as a result of networking. Interestingly, these have happened as a result of a person I’ve met face to face referring me to another person that has hired me to talk, guest post or have bought my services. Always think of how an offline opportunity can help you online. A case study is a real life scenario about an experience within your business. This can include showing people how to use one of your products, talking about a specific scenario & how you overcame the problem, or other examples that would give people an inside glimpse of how it is to do business with you. People prefer to do business with those they know, like & trust and case studies bridge that gap, especially as they help potential clients to get a real feel of how you do business. There are a number of ways to get your casetudies out there, including your website, social media and to simply email your leads and existing clients. This may sound like a bit odd, especially as an Online Marketing Strategy, yet Referrals are by far one of the most cost effective ways to get extra business through the door. There are many ways you can set up an online referral system with one of the most common a simple ‘Would you like to refer me’ email to every customer that has experienced your business. You can also offer a financial incentive (10% off your next purchase) or other incentives to act as a way to entice people to refer your services. So there we go, 5 solid Online Marketing Strategies if you’re on a tight budget. Remember, Marketing Doesn’t Always Cost Money. There are literally thousands of companies out there right now succeeding on a tight budget and many times you just need to think outside the box and use a little elbow grease and creativity. Ok, great. in the next video we’re going to talk about the 5 different types of online content every business MUST HAVE. We’ll delve in deep on the purpose of content and how you can get the best of both worlds to get the search engines to prefer you and for people to find YOU when they’re thinking about your products and services. As always this is David Judge talking online marketing and showing you how to grow your business online.